Dot plots are a relatively new chart type. William Cleveland created them in the 1990s. Dot plots show one or multiple dots on one line. If your emphasis is on the gap between these dots rather than the dots, then a range plot is the better choice. If you want to show how a data point has changed over two years, then choose an arrow plot. At least one dot on each line. It's possible to have many dots on one line, but we recommend to have a maximum of three of them. In exceptional cases, five dots can be ok. If you have more than one dot on a line, a connecting line between these points appears that indicates the quantitative difference. A color key indicates what each dot is showing. The first column contains main categories. Each main category will appears as a line. At least one other column contains numeric values. Each of the numeric columns is represented by one dot on the line. Remember, you can have as many columns as you like, but the more dots you have on the lines, the harder it gets to read. In this case, we have ten different categories, i.e. countries. Be aware that the cells of your table must contain values of the same measures. Each quantitative value will be represented by a dot. 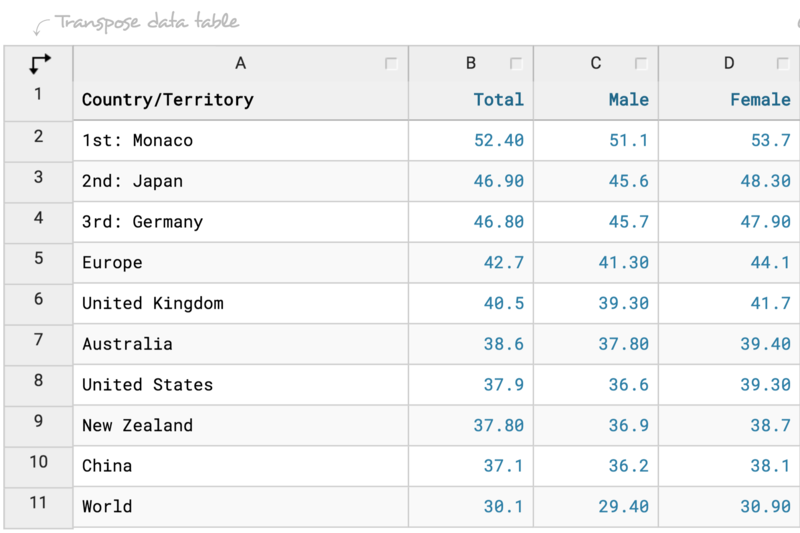 Once your dataset looks like this, you can upload or copy & paste the table to Datawrapper. Once you're in the "Visualize" tab, choose "Dot Plot" and Datawrapper will create the first iteration of your data. Continue with the steps refine, annotate, and design to finish your chart. We'll cover this in a separate short tutorial.